Mercury has unexpectedly come back into the public consciousness. Thanks this is the Europe-wide introduction of “energy saving bulbs”. But few know that many other everyday products are containing the heavy metal, for example, in flat panel displays, timers, fax machines, older boilers, ovens and freezers. Button batteries in two weight percent mercury may still be present, otherwise the use in batteries since 2001 is no longer allowed. The chemical name for mercury is “Hg”. It is the only metal which is present in liquid form at room temperature. Mercury vapor is toxic. They are absorbed in the lungs, enter the bloodstream and cross the blood-brain barrier. Acute poisoning can cause the following symptoms: shortness of breath, bronchitis, fever and headache. Chronic diseases are a result of a long-term recording encephalopathy (brain disease), tremor (shaking) and nephrotic syndrome (kidney Harmful). Long-term consumption can occupationally or via ingestion occur, for example, in the form of edible fish. Particularly tragic it is when mercury passes through industrial effluents into rivers and oceans, and thus enter the food chain. The mercury uptake by abrasion of amalgam fillings is also discussed for years. What are the main issuers? Mercury enters, in addition to natural sources by volcanism or weathering, mainly by the burning of coal products into the atmosphere. The chlor-alkali industry using mercury in large quantities for the production of chlorine and caustic soda. High demand is globally considered also in gold and silver mining. As the hazards of Hg was detected in the industrial area now, it should be replaced by alternatives. Against this background, it seems more than questionable why the fluorescent industry is back on mercury at a current product as the “energy-saving lamps”. What is the role of mercury in CFLs? Compact fluorescent lamps (CFLs) are known as long tube lights to ceilings in offices and factories. 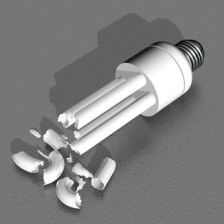 Only with the invention of small electronic control gear and reduced pipe diameters originally voluminous parts could be brought into the size and shape of a conventional bulb. The glass tube of the “energy-saving lamp” is internally coated with a fluorescent phosphor, which determines the color composition of the light. The gas filling is argon and mercury. After switching on, the interior is heated by the flow of current in the argon and mercury vaporizes. This vapor is ionized by applying a current and rendered electrically conductive. The ultraviolet radiation generated is converted by the phosphor coating into visible light. The Hg content in “energy saving bulbs” is depending on the quality of the lamps 3-7 mg.
Knowing the dangers of mercury , CFLs should be handled with precaution. Nevertheless, a fraction can not be excluded by mistake. For precautionary reasons, all doors should be closed, open the windows for cross ventilation and the room not entered for at least 15 minutes. Panic is not appropriate. The chemist and interior experts Dr. Martin Kretschmann from Berlin has determined that in a room with the dimensions of 4 * 4 * 3 meters (50 m3) would just reached the occupational exposure limit of 0.1 mg/m3. However, the precautionary value I of the Federal Environment Agency of Germany for domestic use for continuous exposure is just 0.035 µg/m3. Leaking mercury is absorbed particularly well from plastics such as PVC floors. But even in carpets, wood or painted surfaces may be bound. Definitely not a vacuum cleaner may be used to accommodate the spilled material. The fracture site should be cleaned with a damp cloth small, the fragments are to return with cardboard on paper and then seal in a glass screw together with the rag. Gloves and face masks are recommended. Before delivering at a waste disposal site, it is advisable to label the glass and thus draw attention to the problematic content. As mentioned above, the risk of permanent contamination of the ambient air through contaminated objects apartment is traditionally slim if a lamp has broken. The reasons for a precautionary measure indoor air especially in the bedroom or nursery are nevertheless not be dismissed out of hand. Ultimately, you can not see with the naked eye how contaminated a certain component is and what is discharged thereof into the indoor air. When measuring the fluorescence spectroscopy method is available. Sampling is carried out with a gold steamed substrate. The volume of air varies between 0.25 L and 10 liters, the sampling time of one to twenty minutes. Because of the volatility and mobility of the element are at least two, better perform three sampling runs. Between two measurement cycles is to ventilate well and then keep the windows closed at least an hour. This entry was posted in indoor airpollution and tagged lamp, mercury, mercury-in-lamps on 2013/08/24 by joachim-w.